Michael McFadyen's Scuba Diving - Northern New Caledonia Located 410 km by road north of Noumea, the sleepy locality of Poum has seen the construction of a world class holiday resort, Malabou Beach Resort. There are many dive sites here, most about 35 to 45 minutes away and in the morning it is a pleasant trip out, although the trip back can sometimes be a bit wet due to onshore winds. 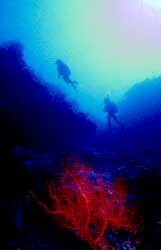 The dive sites are all located on the outside of the Barrier Reef. Due to the reef's isolation, the lack of rivers and no passing boat traffic (including divers, fishers, sailors), the reef is in almost pristine condition. Pacific Diving has 16 sites that they currently visit and more are being found each month. This isolation also means that they get marlins on dives (7 at once) and 11 species of shark (5 species on one dive). On the way out to False Pass, the mainland looks anything but tropical. The coastline is very reminiscent of the South Coast of NSW and it is hard to believe where we are really (later on a bike ride from the resort, I could have easily believed that we were north of Broken Hill in arid western New South Wales!). As the name of the site suggests, this is a break in the reef that looks like an entrance to the lagoon. However, while there are three real passes, the water here is too shallow for anything larger than the dive boat to safely navigate. This dive is done as a drift starting from the south and ending in the middle of the Pass itself. We entered the water in a mass backward roll, quickly dropping to the bottom to avoid the surge. The reef slopes away to 30 plus metres, but in this first part there is no need to go past about 22 metres as all the interesting bits are shallow. The very slight current assists your swim, but never takes control. Tuna, trevally, grouper, triggerfish and others swim past you. The coral is attractive, with some nice but small gorgonias. After 20 minutes Bruno, who is leading the dive, signals to follow him down a hole in the reef. Into a tunnel you go for 25 metres before exiting on the side of the reef at 32 metres. This is different! Very large gorgonias are everywhere. Purple, crimson, red, green, yellow and other colour gorgonias abound. This site is extremely beautiful, with the gorgonias forming a forest in the area outside the tunnel and along the nearby wall. Time is running short so we move into shallower water. The fish are very friendly and abundant. All of a sudden, a loggerhead turtle comes out of nowhere, I take a photograph and it comes right up to me. It is now so close I cannot take another shot. It looks right in my mask, only 20 cm away, before deciding to continue his exploring. I take another photo before it disappears. The water temperature in October was 24°C (Oct to Dec 24, Jan to Feb 28-29) and the visibility 20 metres plus. It is sometimes too cool for a lycra suit but a short wetsuit is okay if you are hardy. Visibility on each of the ocean dives was very good. NOTE: Since I visited New Caledonia the Australian dollar has strengthened against the Pacific Franc so things should be cheaper. Michael McFadyen travelled to New Caledonia courtesy of Dive Adventures, Destination New Caledonie and Air Caledonie International. He dived courtesy of the Pacific Diving Centre. Dive Adventures can be contacted on 02 9299 4633.